In 1958 Italy came third in the Eurovision Song Contest with a song called Nel blu, dipinto di blu (In the sky, painted blue). It became a worldwide runaway hit as Volare performed by Dean Martin and a slew of others, Louis Armstrong, Cliff Richard, Frank Sinatra, Ella Fitzgerald, Pavarotti, Andrea Bocelli, all sang their versions. Just 35k south of Bari Airport, near the top of Italy’s heel in Puglia, is Polignano a Mare, a town perched on craggy cliffs high above a very blue Adriatic Sea. Entering the town a large statue greets with outstretched arms. It commemorates singer-songwriter Domenico Modugno, born and raised here, who wrote and performed that familiar and catchy song. 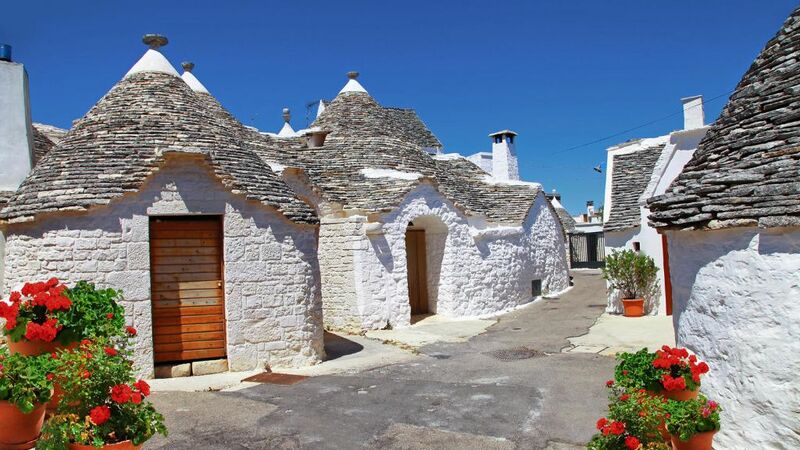 It’s a three and a half hour direct flight from Dublin to Bari, to vast stretches of sandy beaches, nature trails, historic treasures and the renowned laid back lifestyle of southern Italy. We came to discover the simple charm of good down-to-earth local cooking, first-rate olive oils, and discover some unique red wines. 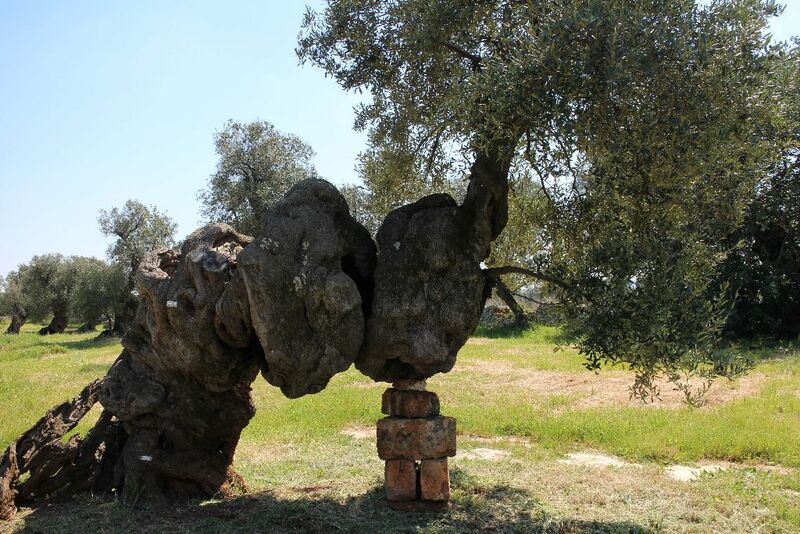 Puglia has over 60 million olive trees, many wonderfully gnarled and very old, two and a half, maybe three thousand years old, maybe more. So much so that in their old age they are often propped up by pillars of bricks and mortar. The olive trees of Puglia provide around 40% of Italy’s olive oil and have 4 Denomination of Origin of Production (DOP) areas: Collina di Brindisi; Dauno; Terra D’Otranto and Terra di Bari. I visited Masseria Brancati near Ostuni, one of the oldest farms in the area with a vast olive grove with trees dating back to the Middle Ages or even the Roman periods. The present owner, Corrado Rodio, with some enthusiasm walked us by rows and rows of trees, introducing many of the older ones by name, as if introducing members of his family. For six generations the Rodio family has produced extra virgin olive oil and now they also have opened the masseria’s doors to guests on a bed and breakfast basis. His guided tour included a visit to an old underground olive mill, abandoned in 1880 but now a museum containing the original stone mills, still in perfect condition, and the numerous tools used in the production of olive oils over the centuries. The tour ends with a tasting of their own extra virgin olive oils, and an opportunity too to take home some tasty bottled memories. During my visit I opted to stay at a Masseria, There are of course other options, hotels, apartments, even traditional trulli, but what makes masserias special is that they are old farm houses that once would have been a centre of the local community, probably owned by noble or wealthy family, and are now restored to the level of a boutique hotel. Many are still working farms with large groves providing their own olives, figs, limes, oranges and vegetables. So it is not surprising to expect some special high-end traditional Apulian cuisine. I stayed at Masseria Valente dating from the late 1700s, built over an underground olive oil mill in caves that existed long before the farm was built. Just off the reception area, old stone steps take you down to you down to the caves where age-old methods for making olive oils are on display. Masseria Valente has 37 acres of natural park, gardens and olive groves, all staunchly committed to organic farming. I dined one evening at Masseria Il Frantoio, another fine farmhouse turned guesthouse, this time dating back five centuries and also a working farm. The food served here was really outstanding. The owner and entertaining host , Armando Ciannamea, talked to us with a poetic turn of phrase in good Italian accented English, insisting that we were not in a restaurant, rather, we were simply guests of his family with food prepared in the farmhouse kitchen by his wife Rosalba and some cooks – he underscored that by proclaiming: ‘no chefs!’ They also produce their own DOP extra virgin olive oil, homemade organic jams and liquors using lemons or oranges and added odd ingredients like wild fennel or olive tree leaves … oddly enough, they work. I remember, as a youth growing up in an Ireland, where butter, margarine or dripping was what the mammy cooked with and olive oil belonged in the chemists, we were not sure what for, perhaps a medication for waxy ears, a pre-Brylcreem hair oil or even to be smeared on to soothe sunburn. All these years later, here in the spiritual home of olive oil, it seems we were half-right. At the Masseria Asciano, yet another farmhouse guesthouse with a fine range of extra virgin olive oils, they also produce an extensive range of olive based creams and cosmetics. It was a once a sanctuary for Byzantine monks fleeing persecution in the twelfth century, a fortress for the Knights of Malta in the fifteenth century and the Amati family farm from the eighteenth century to the present. The Masseria Borgo San Marco welcomes guests. In the grounds, surrounded by old olive trees, all that history unravels. Olive cultivation here goes back five centuries. 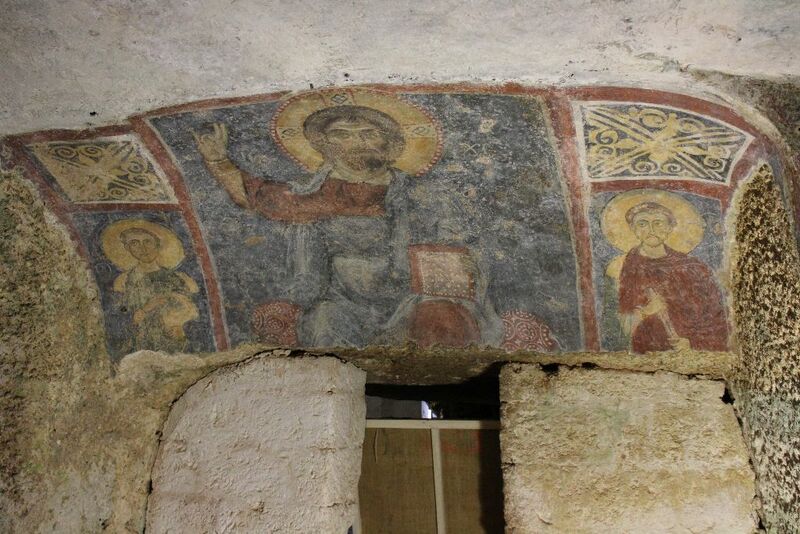 The buyldings once used to house farm livestock was discovered to be a cave church from the twelfth century, contains Orthodox Christian frescos of saints and medieval Greek writings, hidden for hundreds of years behind whitewash and plaster. Southern Italy has less art treasures than northern Italy but it has some well worth a visit. Near the town of San Vito dei Normanni there are so-called rock art sites, some made by Byzantine monks fleeing persecution in eastern Europe. We visited San Biagio, one such Byzantine sanctuary carved into a massive grass covered mound of rock. They contain fine Orthodox Christian frescoes, one dedicated to Saint Blaise reminded me of my birthday and his feast day and how I nearly ended up with the dashing name of Braise Keenan. The other frescoes are of St. Nicholas, St. Andrew, St. George, St. James and St. John, all inscripted in Greek except St. Nicholas in Latin, perhaps a sign of unity between the Orthodox and Churches. Throughout Puglia the pasta of choice is orecchiette, usually homemade by the woman of the family, who else, sitting on a stool outside the front door. You will see them as you wander the streets of towns making this small ear-shaped pasta. It is usually served with cime di rapa, sometimes called Rapini, that’s turnip top leaves to you and me, add olive oil, breadcrumbs and garlic and there you have it, delicious. Bread crumb were a poor mans substitute for a parmesan style hard cheese. Orecchiette is sometimes served with fresh tomatoes and ricotta cheese, in truth, it can be used with any sauce! Another Puglia treat is pettole, sweet or savoury doughnuts. 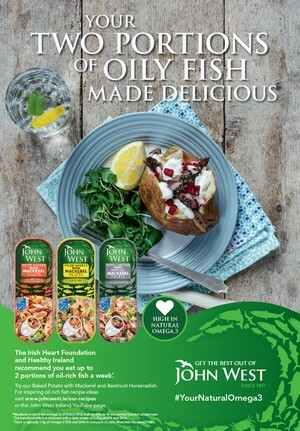 The savoury version can be plain, or they might add olives, cooked cauliflower, salt cod, sundried tomatoes and anchovies. The sweet versions are drenched in vincotto, a dark sweet condensed grape juice, and cooked until it caramelizes and has reduced to about one fifth of its original volume. You might also try a taralli which, they say, is Italy’s answer to the pretzel, which but isn’t. It’s a snack food – a sort of cracker with the texture of a breadstick. Also local is Capocolli – a smoked sausage made from the loin of a pig. And don’t leave Puglia without sin, try a guilty glut of burrata, a local delicacy with less than delicate ingredients, The outer shell is a solid burrata, a local mozzarella style cheese, inside it is soft burrata cheese with added cream and a mixture of butter and salt (sweet versions have sugar). In Italian, burrata means buttery or buttered.